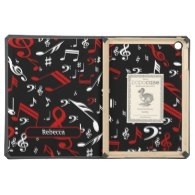 Unique and eye-catching folio cases for the iPad Air with musical designs, including bold music notes, girly glitter treble clefs, vintage gramophones and cats on pianos. 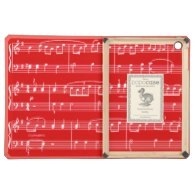 Bold and striking, this iPad Air cover has a musical note pattern in red and white on black. Customize the name for a personalized case. 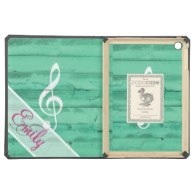 A customizable cover for the iPad Air featuring a large white treble clef on a green wooden styled background. Add your monogram and name. 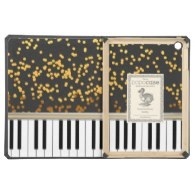 A stylish and elegant music design on an iPad Air case for the pianist featuring piano keys and a golden scatter polka dot on black pattern. 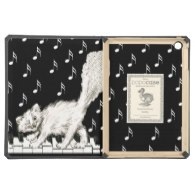 A fun iPad Air cover with a music design featuring a vintage image of a white cat walking on piano keys with a white and black music note background. 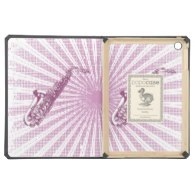 A retro styled iPad Air cover featuring an illustration of old vintage gramophones with music notes on a vintage style background. 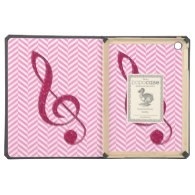 Girly and chic, this pretty folio case for the iPad Air features large treble clefs in a hot pink glitter print with a pink and white chevron background. 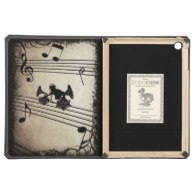 A stunning collection of folio style DODOcases with musical designs ~ unique and striking iPad Air cases with musical notes, musical birds, music scores, piano keys, saxophones and more.